After a quick survey of everyone in the whole bloody world we can confirm that a Sunday roast is the best meal of the week. But, hell, what a palaver. Once you’ve been to the shops, prepared the veg, cooked the meat, eaten it, washed up and finished the wine you’re looking at the other end of three or four hours out of your precious Sunday. 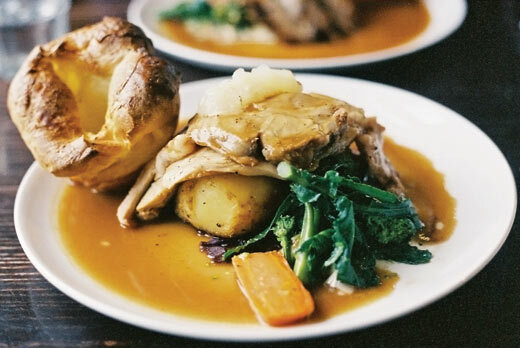 Best bet is to go to your mum’s – who’s roast tops everything in the following list whether she’s Delia Smith or Kerry Katona – but so many of us live too far from our home towns now. Meanwhile your foodie mates are normally too hungover to give you a decent feeding. But there’s always one place you can bank on in life – the pub. Sunday lunch is a nice little earner for boozers so pretty much all of them have a punt. Let’s be honest, some do it better than others and there’s the eternal quest for a good one. With that in mind SOURCE decided to do a massive trawl across town, stuffing ourselves every Sunday for two and a half months. When most other magazines put this sort of article together it’s advertorial, all paid for by the people in the feature. That’s not our style. We went to the places you guys had rated in person and via Twitter. The ten here are the most recommended by SOURCE readers. Most importantly we ate in secret and paid for the meals ourselves. It cost us a fortune, but you can’t trust a food review where the food is cooked especially by the chef and given to the reviewer for free, for obvious reasons. 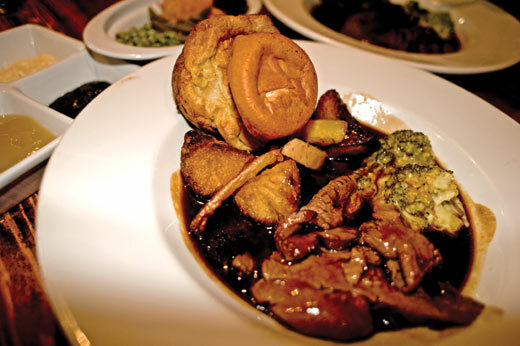 Sunday roasts rock in at around the nine quid mark now, so you don’t want to be throwing your money away on a bad one. This ought to help but although it’s impartial don’t take it as gospel, this is our personal opinion on the meals we ate. This article is now a couple of years old and things change, not least chefs. For an up to date opinion try Rosie Posie’s latest round up. Although tucked away slightly, the Basketmaker’s is one of the busiest pubs in the North Laine so leave it too late and you stand no chance of getting a seat, especially for the Sunday lunch rush. Generally the food at Basketmaker’s is popular because it’s good and cheap and their roast doesn’t head too far from that ethos. Unfussy but homely, it attracts a wide range of people seemingly drawn by the pull of a roast like your mum used to make. While free range, local and seasonal there aren’t many unusual twists here. Generous with the meat – and with two Yorkshires – there’s proper roast potatoes and good crackling, plus the addition of a chunk of butternut squash. Solid rather than sparkling but beware, they always sell out. 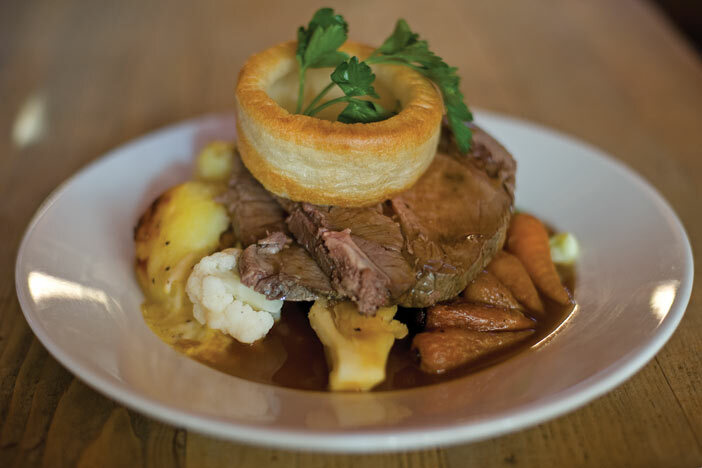 There aren’t many roasts that will give you much change out of a tenner, and if you go for a pudding too you’re looking at up to £20 in some of the pricier pubs. 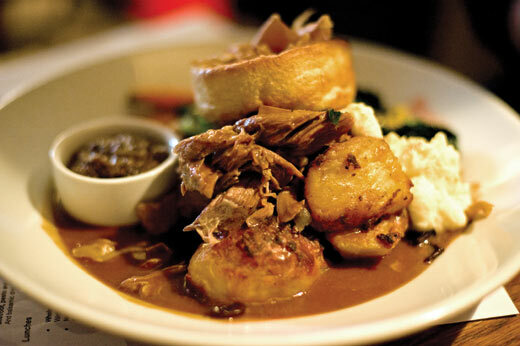 In this climate that makes grabbing a roast a very occasional treat for most of us. The Bristol Bar offers up a real recession buster though. 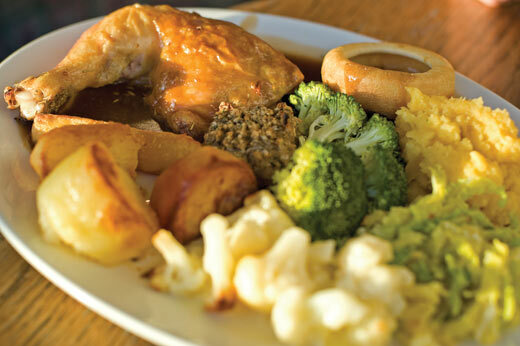 Seven quid gets you not just a roast but a pudding too. OK, so it’s not the fanciest but there are eight elements to it, including swede, broccoli, cauliflower cheese, cabbage, potatoes, and parsnips. The chicken came as a leg but had crispy skin and the meal was all cooked well. Some locals clocked what we were up to and gave us their own enthusiastic review. It might be back to basics, but this is a roast for the community. Roasts at The Dorset ought to be good – they’ve got a restaurant attached to the side of the pub. When they’re not serving every member of every up-and-coming band they know their nosh. Sunday lunch is no exception. Beautifully presented, the veg came separate, and wasn’t undercooked (as often is on Sunday roasts) or mushy. The potatoes weren’t as crunchy as we’d have hoped but there was little to fault, especially with the belly pork and its crisp crackling and tender, tasty meat. The moist nut roast was similarly delicious, containing whole crunchy peanuts. 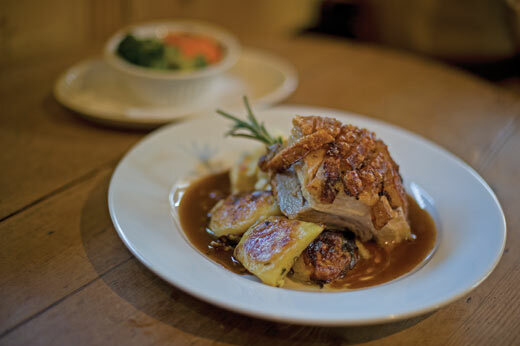 High-quality stuff – this is a restaurant roast at a pub price really. Perhaps the most gastro of all Brighton & Hove gastropubs, The Forager is all about local, in season, organic and – where possible – wild food. Of course this one was going to be good, but it wants to be for the price. The Romney Marsh organic lamb clocked in at £13.50 but that’s about the best sheep-based meat you can get. It’s as tender as if stewed but with all the flavour of roast, while the slowly cooked pork had a crackling taste running all the way through. Huge pillowy Yorkshires were joined by creamy, buttery leeks, not overly-fennelled braised red cabbage, roasted squash, purple sprouting broccoli, buttered leeks, roasted carrot, roast parsnip, Yorkshire pud, homemade gravy. 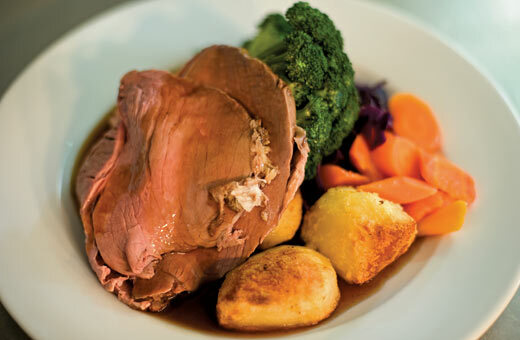 An event roast rather than a hangover cure – get your parents to take you. With it’s low lighting, big party basement and compact bar, The Globe is one of the cosiest winter pubs around. It’s made for getting out of the rain for a long Sunday session. 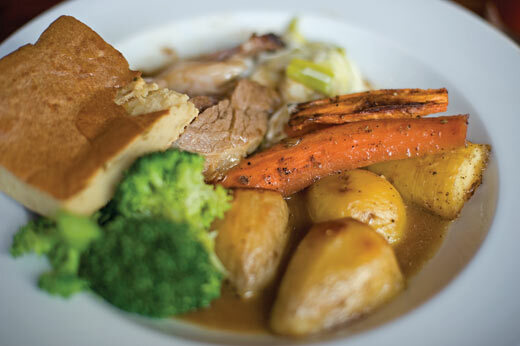 The good news is that you can settle that booze with a great roast and stay even longer. A huge portion of meat (nice thick slices of lamb; very soft, slow roasted pork), bones were still gnawed and some of the party drank the rich gravy from their plates. Yep, we turned into animals. Carrots weren’t undercooked, broccoli wasn’t overcooked, and the cauliflower cheese was a nice touch. We cheekily asked for any scraps and the chef brought us a whole leg of chicken and some Yorkshires. Result! The problem with keeping on top of roasts is that the chefs move on or decide that spending Sunday in a hot kitchen with a hangover isn’t worth the pain. We caught the highly-rated Hampton the week a new chef started. There was a bit of a wait, but you can book a table, and as long as they don’t run out they serve until 5.30pm. The roasted and buttered carrots stood out from a fairly straight up veg selection, and if you like you beef pink you’ve come to the right place. Potatoes are a staple of a roast and these were good and crispy, but we’d have liked the gravy a bit thicker. We resisted buying an extra ten Yorkshire for 30p each. A decent start for a new chef but we reckon they’ll get even better. 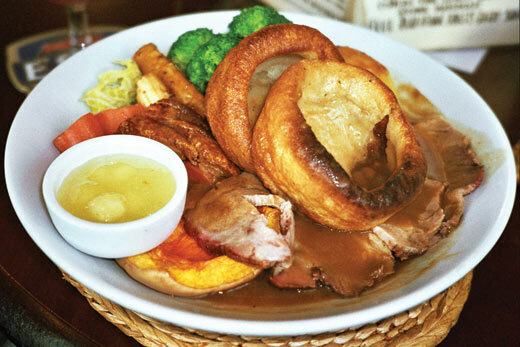 If there’s anywhere that serves as many roasts on a Sunday we’d be surprised. Despite being nice and cosy with lots of little rooms, the L&L is huge. While we were waiting – it was just before Christmas and busier than usual – we saw the poor waitresses running up and down the stairs constantly. It’s popular for a reason, with big portions and no major flaws. The great potatoes were crispy but soft fluffy inside, there was loads of unfatty lamb and crunchy crackling on the pork. Broccoli, carrots and red cabbage were good, although they didn’t have loads of personality. If you want two types of meat you can bung them a quid to go ‘half and half’, while Yorkshires and stuffing cost you extra too. Great service, this is perfect if you’re in a big group. Although it was probably the most recommended roast in our list we got to The Wellington to find it calm to the point of being almost empty. Although this was January, it’s good to know there’s a place to go that you don’t have to book or wait ages for a table. There were only four choices on the meat front and each came with its traditional extras. So, if you want Yorkshires you need to buy the beef. The roast potatoes were the genuine article, not deep fried while the parsnips favoured flavour over crunchiness. Carrots were lightly roasted plus full of taste, and the creamed leeks were not too sloppy. 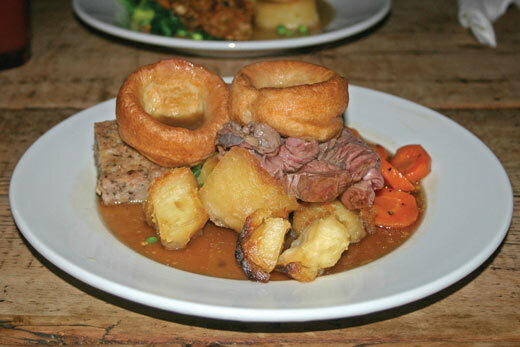 The lamb was a very good cut, but our beef was a little fatty – the only let down in this earthy, real, honest roast. Watch out though, you need to pay in cash. With a much-deserved reputation for excellent food, there’s no wonder that you have to book to get a table on a Sunday at this gastropub. Not the cheapest we tried, the money is all there on the plate though. Our venison haunch was huge, firm and tasty, and just one of many interesting options on the changing menu. From top to bottom it goes from light and crisp – bundles of parsnip chips and a fluffy Yorkshire pub – to hearty and earthy. Savoy cabbage, red cabbage and carrots combine in thick gravy to feel almost like a stew. The only sticking point for one of our team was the stealth beetroot hidden in the masses of food. Great food and pretty good VFM – the resident SOURCE gannet was actually beaten for the first time.